I hope you all had a fabulous Labor Day weekend! I was lucky enough to celebrate the wedding of a very good friend Brian to his beautiful wife Christine and hang out with friends. And the next day...celebrate a housewarming Hawaiian style luau at my friends Barry and Denice's house. 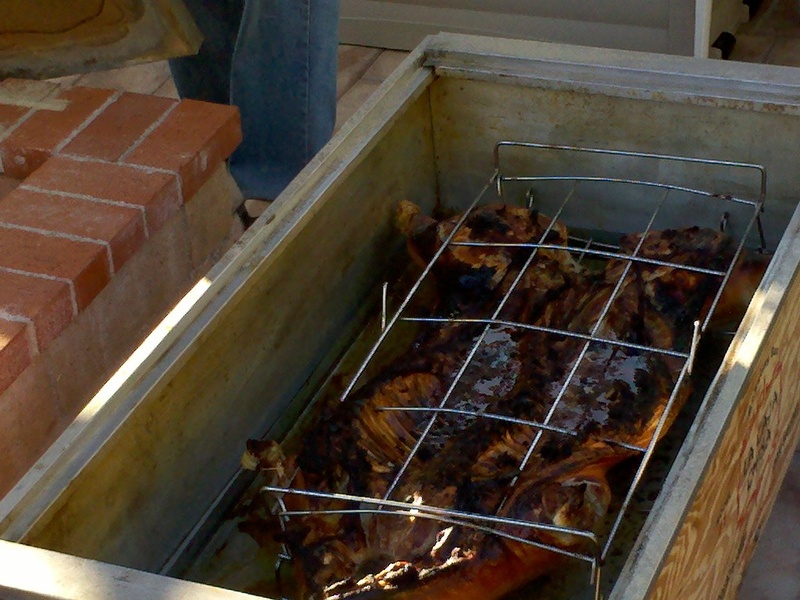 Barry and Denice went all out and Denice's cousin Darrell brought his roasting box and he cooked up a wonderfully brined pig, thanks to Mom! 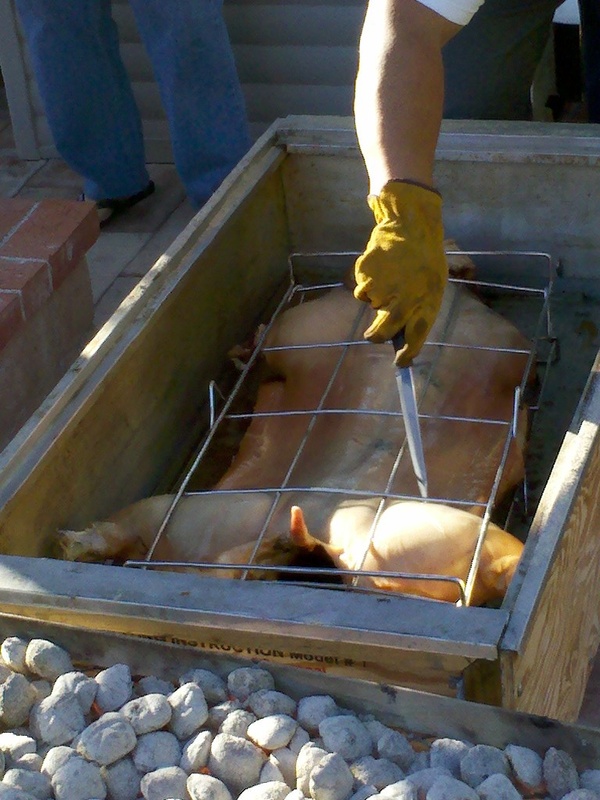 I wasn't there to see the pig go in, but it was certainly an event when it was time to flip the pig...the charcoal was lifted off the top and the cover removed, revealing this beautifully roasted pig. I have never in my entire life seen a whole pig in person like that...so it was pretty cool. It really makes me appreciate what we have. It also makes me think about how lucky and spoiled we are today and how easy it is for us to run to the market and just pick up our ready cut up meat. I think about what people had to do so long ago and to utilize every part of what they have. Crazy! Knowing how much they understood about the whole animal and how to break it down...so amazing. 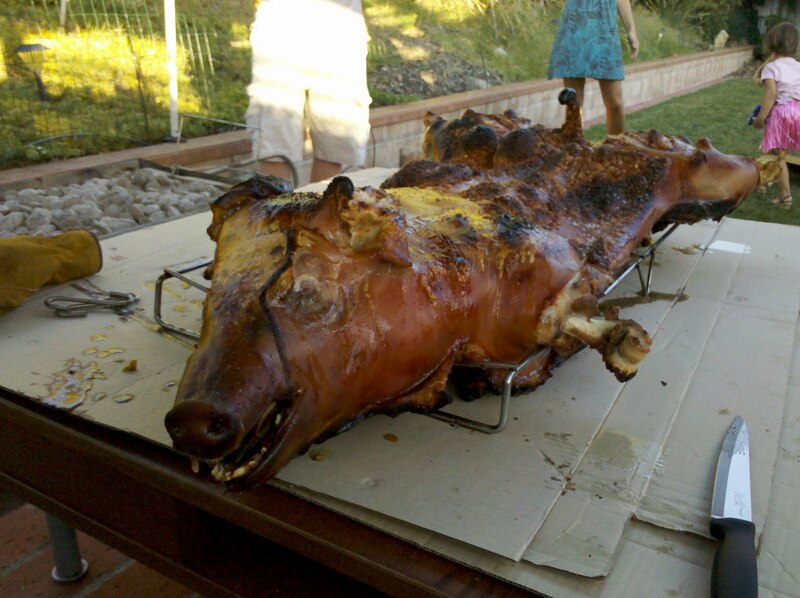 Darrell loves cooking for his family, but I think I might have to talk to him about doing this for special events! 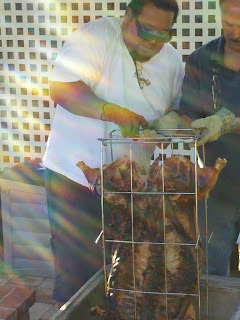 It was really cool that everyone stopped what they were doing so we could watch them flip the pig. 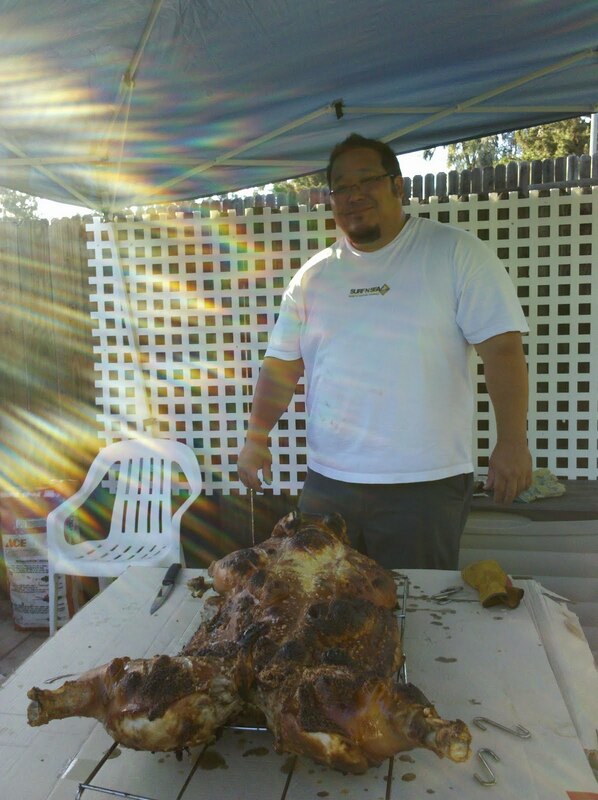 If I remember correctly, this was a 70 lb pig. 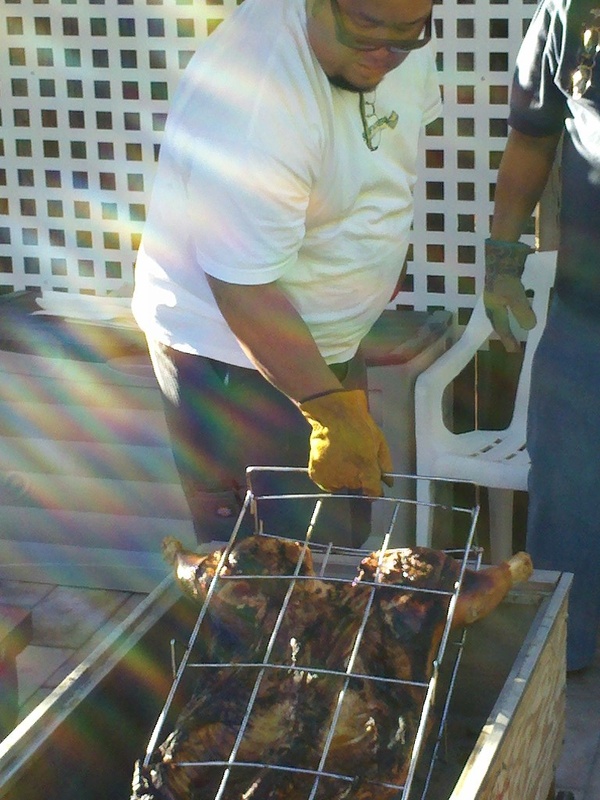 After the flip, Darrell scores the skin to help it split and crisp more easily. 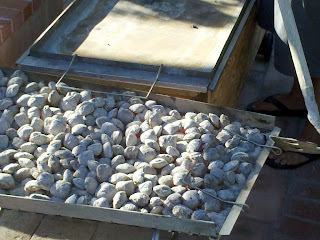 These hot coals just sit on the top cover and creates a hot box to roast that piggy! The pig was delicious!! In all it's porky goodness...the skin was so crispy and crunch and the meat that I got was really tender. Since I didn't start eating pork till about five years ago and now more recently i am truly appreciating pork in all its porky glory, it was so awesome to eat it like this! I did ask Darrell if he could teach me how to do this...NOT because I want to take this away from him...but just because I enjoy learning something new. I think it's so cool!! 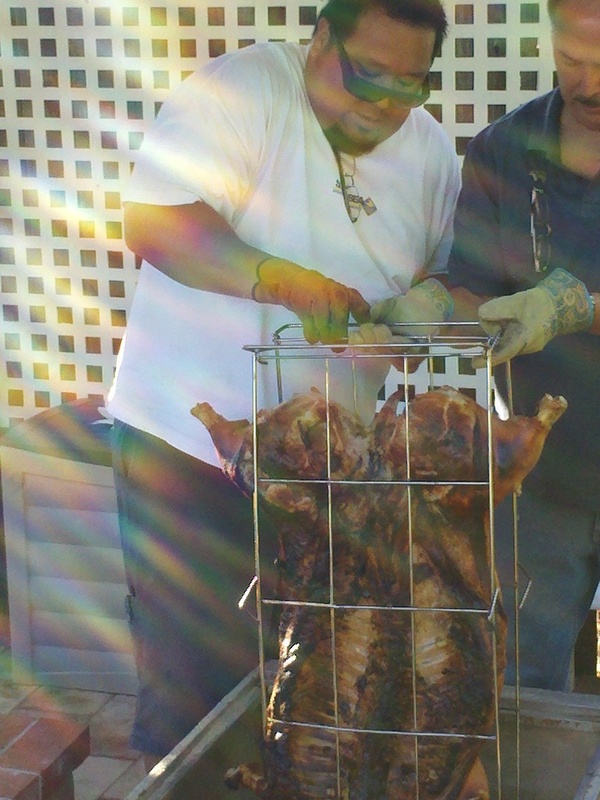 Seeing this whole piggy reminds me of when Anthony Bourdain went on the pig eating fest! Hey Darrell...something to think about...I'll make the rest of the food and you bring your roasting box and the pig!! What do you think?! I think people will love it! Congratulations on the new home B, D & B! !